There’s a standoff at the border, with thousands of Central American immigrants camped out near Tijuana, Mexico. There are reports that thousands more are making their way from Honduras to the United States. While the headlines diminish, the problem intensifies, with no clear solution in sight, with Trump attempting everything from rewriting immigration laws on his own to the incoming Mexican left-wing government, socialist government now being sworn in, and the conditions driving this mass migration are not dissipating. Add to that, so few in our own country, here in the United States, are aware of how our government’s policies over the last 120 years, but more importantly and specifically since the 1980s, have created the conditions that are forcing so many people to flee Honduras, El Salvador and Guatemala. There are now more asylum seekers than ever before. They’ll keep yearning for freedom, seeking refuge and asylum in our country, as our policies on the one hand drive them to our borders and make criminals out of asylum seekers once they get here. Joining us to talk about all this is Pedro Rios, who is director of the American Friends Service Committee’s US/Mexico Border Program. He’s been working on immigrant rights and border issues for over 20 years. And at the Friends Service Committee, Pedro Rios documents abuses by law enforcement, collaborates with community groups, works in both policy issues and with migrant communities. And Pedro Rios, welcome to The Real News. Great to have you with us. PEDRO RIOS: Thank you for the invitation, it’s a pleasure to be on the show. MARC STEINER: So let me just start right at the border with you. Describe what you and your colleagues have seen. What are the conditions for people across the border on the Mexican side at the moment, for the people who are in these camps? PEDRO RIOS: Well, the arrival of the first, larger groups of caravan participants, they first arrived at Playas de Tijuana, which is the beach area of Tijuana. There, they were confronted by a very small but very loud group of anti-migrant protesters who then forced them to be pushed out. At that point, Tijuana’s municipal government opened up a shelter that had the capacity to hold 2000 people. As of yesterday, it was holding 6000 people, and fortunately it was closed. Most of them have moved out, actually all of them have moved out, but only a small fraction of them moved into a new, covered shelter. So this shelter where they were staying at was uncovered, it was muddy because we had just received a significant amount of rain, and it was a very, very difficult situation for the people that were finding themselves at that shelter. MARC STEINER: So I’m curious how you see this unfolding. What we’re seeing now is people attempting to cross the border, going over the fence, being captured by the Border Patrol or ICE as soon as they hit the border, people trying to swim around getting caught as well, more people coming from Honduras, there’s a new government in Mexico being sworn in. And I wonder what you think what’s going to happen next. Because clearly, Trump is being stymied by the courts here, at least for the moment, in terms of what can happen with asylum seekers. And you’ve been watching this for years, this is really unprecedented. How do you see this unfolding? PEDRO RIOS: It definitely is unprecedented. The level of militarization is something that we’ve not seen before in some areas where there is a heavy presence and a heavy footprint of border patrol agents as well as other agents. We’ve seen MP, Army walking around in some parts of the border. And certainly, people are becoming frustrated and desperate that they have to make their way into the U.S. And so, I think, unfortunately, what will happen is that more people will make their way to the border areas and these different policy proposals that Trump is trying to put in place will continue to be blocked. And unfortunately, there aren’t any short term solutions here. We have to find some long term solutions where both governments make sensible decisions about how to treat and how to deal with the larger implications of immigration in their countries. MARC STEINER: So these are two really quick questions here, I think really important to kind of look at this. One is taking a step backwards, I mean, a step backwards in terms of understanding the issue. 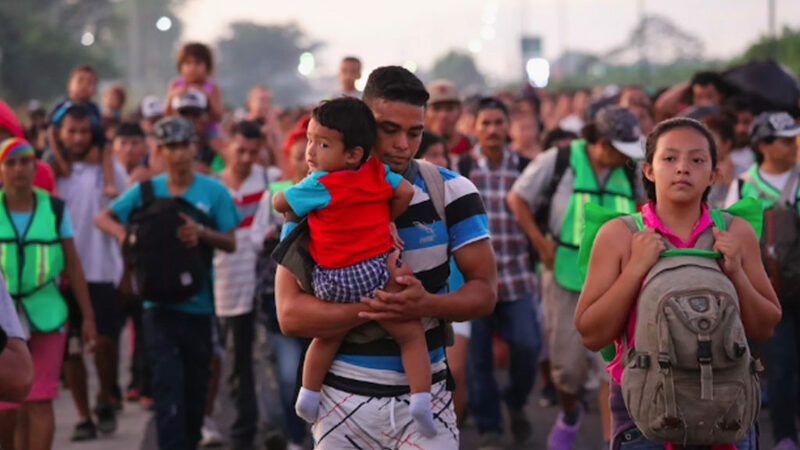 Why do you know, what are people saying to you about why they are fleeing Honduras, why they’re fleeing El Salvador, why are they fleeing Guatemala? And what role do you think our government had to play in that, just the fear that’s happening there, and exactly what people are telling you about what’s going on? PEDRO RIOS: I mean, it’s interesting because I think it comes down to several different factors. One of it is violence, untold violence, in all of those three countries, so Honduras, Guatemala and El Salvador, and that violence takes on different shapes. Some of it is state-sponsored violence. We still hear of death squads in El Salvador and Honduras. We hear of organized crime – and the same thing in Guatemala. But even multinational corporations, mining companies that are displacing people violently, and so they have no other place to go until they are forced to migrate. So those are real conditions; a lack of job opportunities, a lack of economic well-being, these are creating the conditions where people are being forced to leave their homeland. And I think it’s important to highlight how the U.S. has had a role in that. If we consider the country of Honduras in 2009, the impact that the government coming in with essentially having had the green light by the Obama administration, allowed for a democratically elected president to be removed from office. And so, all of this creates the conditions, the instability for people to have no other options but to find a way to migrate out of their countries. MARC STEINER: So one of the things, as you just mentioned a moment ago – I want to talk about what the future could hold. Let’s talk about solutions to this. I mean, I’m very curious. You’ve been working in this area for over twenty years, it means a great deal to you, it’s your life. And if we had the power, if you had the power, if people as you could make policy decisions, what would be happening now that would change the nature of what we see? What should happen with the folks who are on the border at this moment? PEDRO RIOS: Well, I think there are domestic solutions that the U.S. can make and then there are international solutions that need to be discussed. One is that we need to begin by demilitarizing border communities. Essentially, we’ve lived under the hood of militarization for too many years in our communities, and that’s not the way to address these social and political problems. We need to ensure that everyone who is seeking asylum has an opportunity to do so. And so, by the Trump administration restricting those opportunities, it really is exacerbating that humanitarian crisis that people find themselves under. And then, equally as important is how both the U.S. and the Mexican government, as well as the governments of Central America, are able to address these root causes, if they’re able to address the conditions that cause violence. And I think that’s one of the ways to try to deal with immigration in a holistic way. With migrants that find themselves in Tijuana today, we need to first meet their humanitarian needs, ensure that they’re being cared for and that their dignity is upheld, and not respond with violence, with more military – by what we’ve seen the Trump administration doing. MARC STEINER: So what do you think, Pedro, will happen, though? What are the signs you’re seeing now if you’re looking at a situation where there are thousands of people camped out at the border, clearly many more are coming, people fleeing their countries, making their way through Mexico? We now have a government in Mexico which is a left wing, a socialist government that clearly has a different agenda than the previous government did, and I’m curious where you think this could take us. I mean, there are people now trying to get over the wall every day and get around the wall and we’re talking about many thousands more arriving. This is, as you said a moment ago, hugely unprecedented. Where do you think this might take us in reality, in real time, given the Trump administration? PEDRO RIOS: I mean, unfortunately, I think what will happen is that the Trump administration is going to find other ways of restricting people’s right to seek asylum, and I think that’s a wrong approach. What they should be doing is placing those resources in making the process much more faster so that people don’t have to wait months in Mexico. Tijuana, at this point, is a dangerous city. And for migrants who have nothing for themselves, I think it places them at greater risk. And both the Mexican government and municipal state and federal governments need also to ensure that they prioritize the needs of the migrants who find themselves in their country. MARC STEINER: Well, I really do look forward to having you joining us again numerous times as we watch what happens there. I mean, you’re right there, you’ve been watching it, you’ve been involved for so long, and I do appreciate all the work you do, Pedro Rios. Pedro Rios, with the American Friends Service Committee, I thank you for joining us here today on The Real News, it’s been a pleasure to talk with you. PEDRO RIOS: I appreciate it. Thank you so much.